Upgrade Accommodation (subject to availability at the time of booking): This upgrade option provides travellers with twin style accommodation for the duration of the tour ( excluding nights where camping is applicable ). Upgrade accommodation ( subject to availability at the time of booking ). This option provides travellers with a Single room in hostels for the duration of the trip. 10 days of Kakadu & Litchfield National Parks, Katherine Gorge, Tennant Creek, Devil’s Marbles, Uluru (Ayers Rock), & more! 10 days of guided touring, 20 meals, park entry fees, 6 nights comfortable safari tent, 3 nights budget accommodation with an option to upgrade and all of this while travelling with other fun loving and active travellers from all over the world. (Lunch, Dinner) You will be collected from your Darwin accommodation at approximately 7.00am for the short journey to Litchfield National Park. Explore the waterfalls, spring-fed streams and rugged sandstone escarpments of Litchfield National Park. Discover intriguing cathedral and magnetic termite mounds and swim, hike and explore Florence and Wangi Falls* and enjoy a picnic lunch.After lunch we leave the highway behind and hit the dirt travelling along the Marrakai Road before joining the Old Jim Jim Road taking us deep into Kakadu National Park. Travelling past billabongs and traversing water crossings bringing ample opportunity for wildlife spotting. Arrive at our private campsite complete with comfortable permanent tents at Cooinda where we spend the night enjoying dinner and some stargazing. (Breakfast, Lunch, Dinner) Awake for breakfast this morning before joining an iconic Yellow Waters Cruise. A must do activity within Kakadu National Park, the award winning Yellow Waters cruise is Aboriginal owned and centres around a spectacular billabong system that is home to some remarkable and diverse wildlife. Spotting crocodiles is only one of the many wildlife viewing opportunities on this unique water system.Departing camp we travel to nearby Nourlangie Rock. Here you can see how local Aboriginal people lived in this area through changing times. Environmental and social changes are reflected in the rock art and in the ground, where archaeologists have uncovered over 20,000 years of Aboriginal occupation.After lunch visit the Bowali Visitor Centre, a Gun-djeihmi name for the local area and creek on land owned by the Mirarr clan. See the audio-visual presentations and Marrawuddi Gallery showcasing Aboriginal art by artists from within Kakadu and the wider region.Later this afternoon we arrive at the culturally significant Aboriginal art site of Ubirr, located within the East Alligator region of the park. Here you will view a wide range of ancient Aboriginal art which will be interpreted by your guide. Learn the story of the Rainbow Serpent and climb the Nadab Lookout for panoramic views over the floodplain and beyond into Arnhem Land. After learning about the area, it’s time to pick out a quiet spot to sit while we watch the sun set over the Kakadu escarpment before making the short journey to our private and permanent campsite for the night. (Breakfast, Lunch) Today the jewels of Kakadu National Park await. Departing early we travel to Twin and Jim Jim Falls. Explore Twin Falls Gorge which is accessed by 4-wheel drive track, a boat shuttle service and a rocky walking track and boardwalk. Once there relax on the sandy banks and admire the falls. There’s more 4-wheel driving as we make our way to Jim Jim Falls where a walk through monsoon forest and over boulders takes us to the waterfall and plunge pool which are surrounded by 150 metre cliffs.Spend the afternoon taking in the sheer beauty of your spectacular surrounds before we make our way back to Darwin and your accommodation after three magical days of adventure and wildlife, rich in cultural history and natural beauty. (Breakfast / Lunch / Dinner) A great start to the day, is a soak in the Mataranka Thermal Pools, a lush oasis fringed by paperbark trees. No trip to the ‘Territory’ is complete without a visit to the Daly Waters Pub, an important watering hole for explorers and drovers in days gone by and now a great spot for a cold beer, a bit of history and a ‘fair dinkum outback experience’! Our day winds to a close at historic Banka Cattle Station where we camp for the night. (Breakfast / Lunch) We pass through Tennant Creek and then further along the track are the Devils Marbles (Karlu Karlu) which are a collection of gigantic granite boulders magically balanced on top of one another. Later in the day we cross the Tropic of Capricorn (only 20% of the Northern Territory lies south of this point) then a short time later we arrive into Alice Springs. Two night’s accommodation in Alice Springs is included (For passengers on 2 nights Alice Springs Option only). A day at leisure to either relax or explore the Red Centre township of Alice Springs. All activities and meals are at your own expense. Dorm accommodation in Alice Springs is included. (Lunch/Dinner) After picking you up from your accommodation in Alice Springs bright and early, we hit the road on our adventure of a lifetime (For those commencing the tour at Uluru, we will collect you from the Outback Pioneer Hotel or the airport).Our journey begins heading south through the Waterhouse and James Ranges with a stop at the Camel Farm for a Camel ride if you're keen (own expense). We stop at Mount Ebenezer Roadhouse where you can view or purchase Aboriginal artefacts. Stop to view Atila (Mount Connor), a mesa tableland and the first significant rock formation of our trip. After a stop for lunch and our arrival at the Uluru - Kata Tjuta National Park, we head to the Cultural Centre for the opportunity to learn about the local Aboriginal law and religion (Tjukurpa). We then head to the base of Uluru where we meet our local Aboriginal Guide who will provide a once in a lifetime authentic Indigenous cultural experience with an interpretive walk to Mutitjulu Waterhole where you will hear the stories of the unique landscapes, art and culture of the local custodians, the Anangu people. Experience the famous changing colours of Uluru at sunset, away from the crowds, complete with sparkling wine and nibbles.It's a great time to kick back and contemplate the day and the vastness of the desert. Afterwards settle in at our remote private camp, complete with our signature Endless Star dining experience before retiring to your swag under the amazing night sky or your comfortable safari tent complete with beds. (Breakfast / Lunch / Dinner) Rising early, take a short walk to a lookout close to our campsite to view sunrise over Uluru and Kata Tjuta without the hustle and bustle of the public viewing areas before heading off to Kata Tjuta for a walk through the "Valley of the Winds". Afterwards, we're off to Kings Creek Cattle Station for our second nights' private bush camp, complete with bush toilet and shower. With nobody else for miles, this camp has stunning views out over the George Gill Ranges and gives you a real feel for the outback. Dinner around the campfire makes for a very social time with another night out under the stars. Tonight, listen for the sound of dingoes howling in the distance while watching the desert sky light up above you. Passengers need to take caution during December/January period where temperaturs in Central Australia can get quite high. Its advised to prepare accordingly. What form of vehicle do we use? For our Uluru Tours we toss between a Troop Carrier 4WD Landcruise and a 4WD Mini bus. This depends on the size of the group and the amount of days we are out in the park. Each tour varies so please refer to your tour info panel on the top right hand side of the page. Are there days where we travel for a long time? During the first day we usually do a couple of hours driving to get out of the city and into the country side. However, once in the national parks, trips between attractions usually take between 30minutes to an hour. For tours heading up to Darwin or down to Adelaide, expect periods where we drive for a few hours at a time. Australia is enormous and the distance between towns and attractions can be quite large. But don't worry, we take plenty of breaks so your able to stretch and move about. 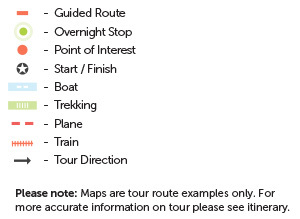 For more accurate information please see tour itineraries.